Hi everyone! I’m so sorry, I know I’m getting these out late this year, but better late than never right!? So for those of you who have enjoyed using my monthly scrapbooking templates to create annual scrapbook pages or calendars, here are my new 2016 monthly templates for you to use! I used to make an annual calendar pages for my parents, in-laws, grandparents etc. But I’ve since started making these pages and just adding them to an ongoing scrapbook for our parents. It just gives them a nice overview of our year in scrapbook form. These templates are super easy to use, you just add photos, and some text if you want. And that’s all! Then print them out and you’ve got yourself a super quick scrapbook of your year! All files are 300 dpi .png images. NOTE: You will need a software program that can open .png files to edit these templates. Or you can just print the files on photo paper and then add your photos to them using archival safe glue strips. Using your favorite editing software, all you have to do is open the file, insert your pictures and a little journaling and voila! You’re done! Print the templates, then cut and paste on your favorite photos. You can even take the completed pages to an office supply store and have color copies made so you can create several copies quickly and easily. What to do with your finished creations? 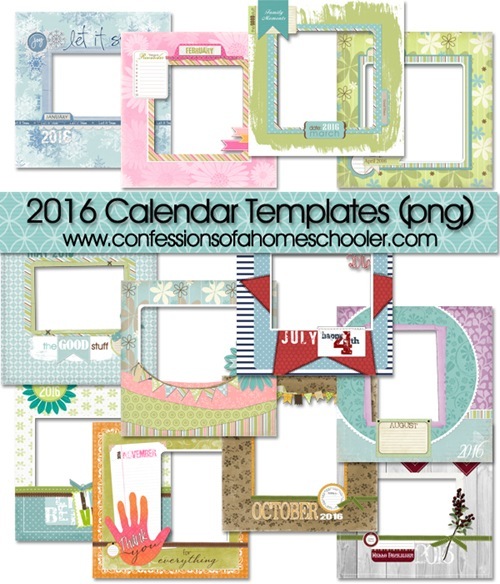 Upload them to a photo website and create calendar pages with them as gifts. Cut up your used calendar pages once the year’s done, and insert them into an 8×8 scrapbook to create a wonderful keepsake! Can’t print at home? Here are some of my favorite places that you can upload your finished images and turn them into holiday gifts! Click below for some more fun templates! Note: These templates work with any photo editing software that can read .png files. I typically suggest Adobe Photoshop Elements for digital scrapbooking. It has the most flexibility and ability to read various image formats. It is also really easy to work with and inexpensive! Don’t forget to use your student/teacher discount if you’re a homeschooler or teacher. Need help? Here is a post on getting started with digital scrapbooking if you have questions. Visit Erica Made Designs to see all of my digital scrapbooking supplies! Thank you so much! They are beautiful! Our homeschool group makes yearbooks every year. I can add as many pages as I want at the end for my own children’s personal books. I’d love to use these pages, but the books are 8.5″ X 11″. How do I go about re-sizing the pages to 8.5″ X 11″? The girls will keep these forever. Thank you so much!